Perfect for summer, the slab pie seems to be everywhere these days… in food magazines, on websites and blogs. CLICK HERE for a recent such example in the Denver Post. This pie variation doesn’t completely re-invent the wheel but it does put a new spin on it. A slab is simply a shallow pie made in a rectangular jelly-roll pan instead of in the traditional round pie plate. The benefits? You can press the dough into the pan by hand (no need to roll it out), it’s easy to cut and serve with a spatula, and it’s a great summer dessert for feeding a crowd. Any fruit or berry pie recipe will work in this format. Just double your filling recipe (so you have enough to fill a 15-by-10-by-1-inch pan). 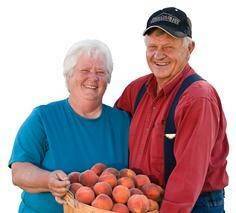 Find fresh fruits and produce at Ranch Foods Direct, arriving weekly from area farms.